Water standing in the open at 32ºC evaporates because of the escape of some of the surface molecules. 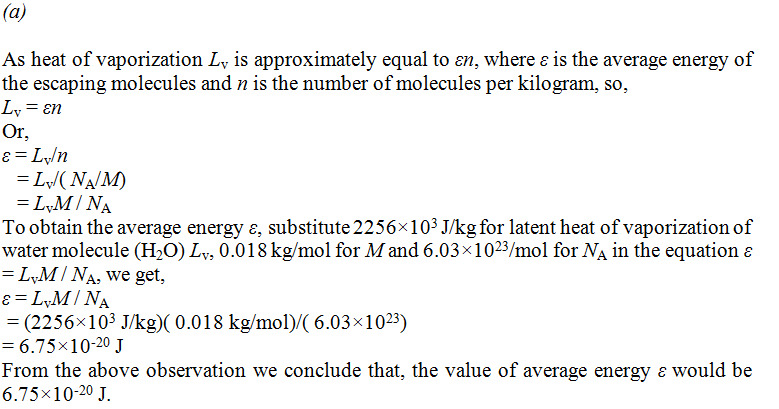 The heat of vaporization is approximately equal to ϵn, where ϵ is the average energy of the escaping molecules and n is the number of molecules per kilogram. (a) Find ϵ (b) What is the ratio of ϵ to the average kinetic energy of H2O molecules,  assuming that the kinetic energy is related to temperature in the same way as it is for gases?